A funeral service for Irene Pulliam, age 92, of Neches, is scheduled at 10:30 a.m. in the morning, Saturday, April 13, 2019 at First Christian Church, Medicine Lodge, Kansas. Mrs. Pulliam will be laid to rest at Sharon City Cemetery in Sharon, Kansas. Visitation will begin on Tuesday, April 9, 2019 and friends are cordially invited to visit with Irene’s family from 6 to 8 o’clock in the evening at Autry Funeral Home, Jacksonville. Mrs. Pulliam passed away Saturday, April 6, 2019 in Elkhart. 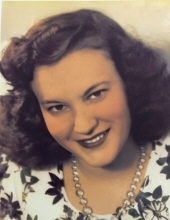 Irene was born in Medicine Lodge in Kansas to Walter and Florence Stienbarger Williams. She was preceded in death by her parents; husband, John M. Pulliam, son Elbert Lynn Pulliam, brother, Walter Williams, and sister, Carol Jean Black . Left to cherish her memory are her sons; Melvin L Pulliam of Neches, Melton R Pulliam and wife Barbara of Ridgedale, MO, Robert D Pulliam of Venus, Texas; daughters, Anita J. Flynn of Elkhart, Johna J Pulliam of Springfield, Ohio. "Email Address" would like to share the life celebration of Irene Pulliam. Click on the "link" to go to share a favorite memory or leave a condolence message for the family.